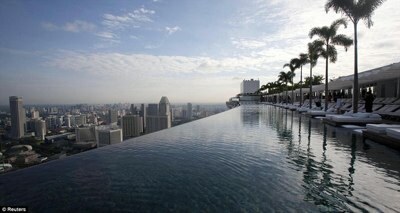 If you fancy a dip in this pool, you’ll need a head for heights – it’s 55 stories up. Swimming to the edge won’t be quite as risky as it looks. While the water in the infinity pool seems to end in a sheer drop, it actually spills into a catchment area where it is pumped back into the main pool. At three times the length of an Olympic pool and 650ft up, it is the largest outdoor pool in the world at that height.